After several days spent tearing up the local crags, today our Epic Climber team of Hazel Findlay, Alex Megos, Emily Harrington and Tommy Caldwell are heading indoors. These four climbers all have very different relationships with the climbing gym and wildly differing approaches to climbing in general. Nowhere is that more apparent than when they're all pulling on plastic together and as the group sets different projects for each other, individual strengths begin to emerge. More than that however, attitudes towards the role of indoor climbing are challenged as Alex is forced to admit that you can't simply power your way through everything at the gym and Tommy begins to see the benefits of the explosive training style of which Alex is a major proponent. 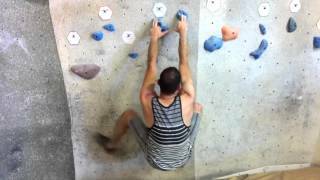 Climbing workouts and functional training with Daniel Woods by The North Face Training for more than a game. Get equipped to push your limits outdoors with purpose-built training programs and new gear that is built to endure the toughest workouts. Set your goal, get activity-specific workouts, and shop the Mountain Athletics collection at www.thenorthface.com/mountainathletics. 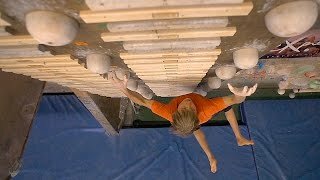 Climbing Workouts - Footwork Technique Training - Drills and Exercises - is a training video focusing in technical footwork. In a typical training routine, footwork technique is ignored and taken for granted, what we don't know is at which extent our poor footwork technique is becoming a limiting force in accomplishing the climbing projects we set. A precise and polished footwork can be trained and must be included in our training routine (and session). Improving your footwork in climbing will surely make the difference in more advanced movements.